What Should I Do with My Traveler? The traveler is a great sail control that when used correctly can make a big difference. Quantum’s Dave Flynn explains the best way to use the traveler to get the perfect mainsail trim. The traveler is a great sail control when it comes to fine-tuning the mainsail to maximize power and control helm and heel angle upwind. A general rule of thumb is to use the mainsheet first for the gross tuning, then fine-tune using the traveler. Here is what a general sequence using the traveler might look like. First, set the mainsail twist using the mainsheet. Trim the sail so that the top batten is parallel to the boom and make sure the top telltale is just on the verge of stalling. Next, position the boom on the centerline with the traveler to create your baseline and position for power. In light air, this will pull the traveler car itself well up to weather in order to put the boom on centerline since the mainsheet will be eased to allow the leech to open up. As the breeze builds and the sail is sheeted harder, the traveler will drop. As the boat begins to develop too much heel and the weather helm that goes with, it lower the traveler to keep the boat on its feet. The traveler car and the boom will be below centerline by whatever amount it takes to control heel. The traveler is perfect to control balance with the normal puffs and lulls. In the really big puffs, you may need to ease the mainsheet as well to depower, but try using the traveler whenever possible. In more traditional masthead rigs with overlapping headsails, you can play the traveler quite extensively and make relatively small changes to mainsheet tension. 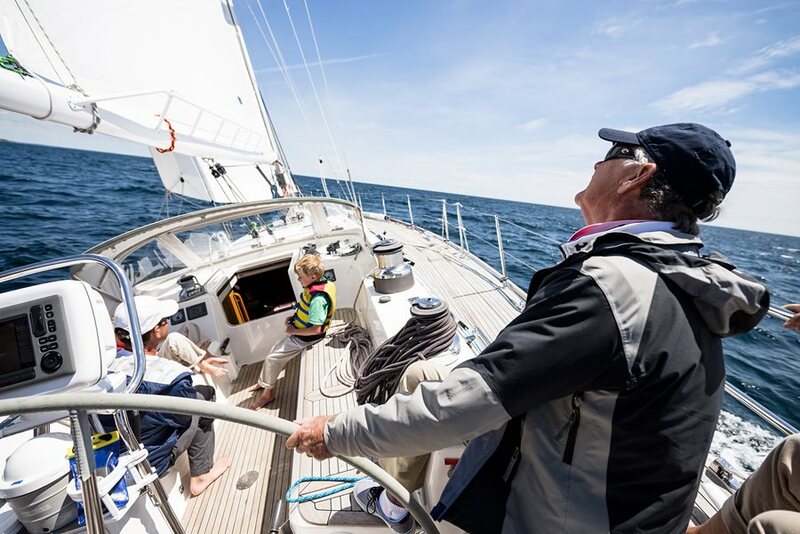 On the newer breed of sailboats that have big fractional mainsails and smaller non-overlapping headsails, the traveler tends to move less, remaining closer to the centerline, and the mainsheet is played more aggressively. The traveler is the perfect tool for balancing heel and controlling helm, especially when cruising. It also makes life easier for the autopilot! Find a good average setting for conditions and fine-tune the traveler to keep the boat from heeling excessively. Have a sail control question of your own? Click here to visit our Ask the Expert portal to get an answer.